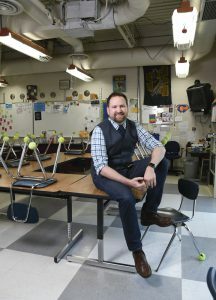 Neal Cronkite says his first year as an educator was a “train wreck.” Fast forward 12 years, and the middle school science and math teacher from Holt this spring was named the winner of a national award considered the “Oscar” of teaching. Now Cronkite has found his way to both run a tight ship and inspire joy, quietly but firmly redirecting his fifth graders when they misbehave but also joking with them, sharing in their personal lives, and even singing goofy songs with his guitar to create lasting bonds. For his leadership and creativity, the Washington Woods Middle School teacher was honored with the Milken Educator Award at a surprise ceremony this spring. “I was stunned,” he said. Cronkite is involved in many building and district leadership initiatives in math and science to make learning meaningful, increase student engagement, and help students self-assess through standards-based grading, in addition to mentoring new teachers. He coaches kids in reading competitions, leads a running club, and participates in “Erase the Word,” a campaign to stop derogatory language toward students with cognitive impairments. His Milken award came with a mentor—a former winner from Florida who is helping him tap into professional networks and development to use the national platform he’s been given. The Milken Family Foundation encourages winners to exercise their voice in the public arena.